St. Basil's Cathedral is the name of the elegant Russian Orthodox Church that is situated in the Red Square in Moscow| Russia. This one of a kind church was commissioned by Ivan the Terrible in the 14th century. The Frank St. Basil's Cathedral is a miniature that you can construct at home. The kit comes with pieces that are easy to assemble and do not require the use of scissors or glue. This puzzle kit is perfect for both boys and girls over the age of 5 who love learning about history. The famous St. 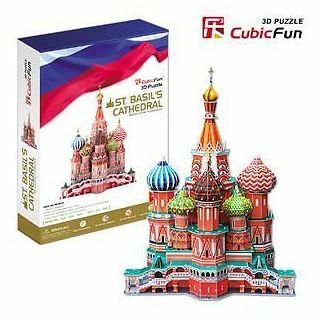 Basil's Cathedral was commissioned by Ivan the Terrible and built on the edge of Red Square between 1555 and 1561. The cathedral was built to commemorate Ivan the Terrible's successful military campaign against the Tartar Mongols in 1552 in the besieged city of Kazan. St. Basil's is a delightful array of swirling colors and redbrick towers. Its design comprises nine individual chapels| each topped with a unique onion dome and each commemorating a victorious assault on the city. - Assembly convenient| do not need to use glue| scissors and other auxiliary tools. - Made of EPS foam board| Security and avirulent| environmental protection. - Training your brain and hand coordination ability| improve your visual discrimination ability| build your space imagination and get a true fun! - It's with rich connotation| rich historic and cultural knowledge| popular science knowledge| increase your knowledge. - After you assemble it completely| it can be used as a beautiful home furnishings| is of highly appreciation| and plus lighting| it will be more glow.